24 May 2019 marks the date of the European Parliament Elections, which will take place on the same day as the local government elections. eolas magazine reviews the current representation of Ireland in Brussels ahead of voting day. President Jean-Claude Juncker has stated that he will not seek a second term as President. Alexander Stubb, vice president of the European Investment Bank and former finance minister, foreign minister and prime minister of Finland has been tipped to replace him. Meanwhile, Manfred Weber, group leader for the European People’s Party in the European Parliament has been proposed as the next president by Angela Merkel. Weber was later elected as the party’s presidential candidate at their 2018 congress. The 2019 elections will see the debut of a number of new parties, such as Kukiz ’15 and Spring of Poland, Alliance and Liberal Initiative of Portugal, USR of Romania, Worker’s Front of Croatia, the Czech Pirate Party of the Czech Republic and Sme Rodina of Slovakia. Observers are torn in their predictions: whilst some believe the EPP will remain a dominant force, others predict a strengthening of populist voices. 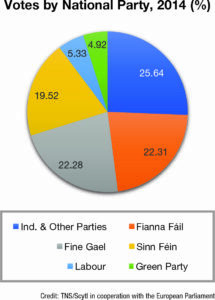 In Ireland, under Article 1 of Council Decision 2002/772/EC, voters elect MEPs through proportional representation with a single transferable vote (PR-STV). Eligible and registered voters do so in order of preference, indicating their first and subsequent choices of candidates on the ballot paper by marking a number beside the candidate’s name. No thresholds are applied. Whilst most member states serve as single constituencies, five member states, including Ireland, have divided their territory into regional constituencies. Election results are validated by the courts, with Members of the European Parliament (MEPs) elected via a secret ballot for a term of five years. The minimum age to stand for election in most member states in 18. However, in Ireland it is 21. 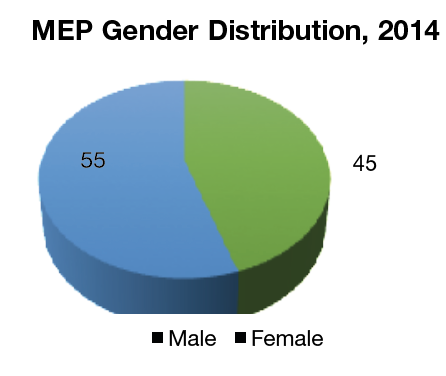 Unlike domestic elections in Ireland, European byelections are never held when a seat in the European Parliament is vacated by a MEP. When a seat does become vacant (following resignation, or death, for example), a list of replacements who can substitute for them, devised by the candidate or party, is presented, with the vacant seat allocated to those on the list. The United Kingdom’s departure from the European Union means that the total number of seats in the European Parliament will be reduced from 751 to 705, with some seats being redistributed amongst member states. Following the Brexit vote, Minister for Housing, Planning and Local Government, Eoghan Murphy TD, made an order under section 5 (1A) of the Electoral Act 1997, establishing an independent committee to report on European Parliament Constituencies. This follows a European Council decision on 28 June 2018 which provided for 13 members to be elected in Ireland in the 2019-2024 parliamentary term – an increase from the previous 11 members. This has required a review of European Parliament constituencies and by extension a public consultation process. Recommendations from the European parliament and the Constituency Commission proposed changes to Irish electoral constituencies: Dublin gains an extra seat from three to four, with no boundary changes. The South constituency gains an extra seat from four to five, and gains counties Laois and Offaly from Midlands-North-West. Meanwhile, Midlands-North-West loses Laois and Offaly to South but remains a four-seat constituency. As the Brexit deadline approaches, the Irish Government Cabinet have been involved in discussions around the more complex ramifications of the decision. Indeed, the two seats allocated across the South and Dublin constituencies will not be taken up until the UK has left the EU. To date, no decision has been made as to salary and expense entitlement for these seats in the interim period. The Cabinet have also discussed the voting rights of British citizens in European elections, with particular reference to voters in the North. Under current EU legislation, only EU citizens are entitled to vote and stand in EU parliament elections, meaning that British citizens residing in Ireland will have no right to vote in EU elections in Ireland in the event that the UK leaves the EU. This issue has been one of high priority as we approach voting day on 24 May.